After sleeping away the unsettlement caused by finishing the book last night, I remembered to check my notes for the text I found interesting. -- "One passenger noted that if the need for a new Noah's ark ever arose, he would skip the bit about building the boat and just charter the Lusitania, "for I calculate that there is room on her for two of every animal extant and more."" Seems like an interesting plot for a sci-fi novel. -- "As one historian put it, "Europe had too many frontiers, too many - and too well-remembered - histories, too many soldiers for safety."" -- "The United States is remote, unconquerable, huge, without hostile neighbors or any neighbors at all of anything like her own strength, and lives exempt in an almost unvexed tranquility from the contentions and animosities and the ceaseless pressure and counter-pressure that distract the close-packed older world." An interesting point. Reminds me of an article I read about how the excess space of the country, and especially the excess size of certain states, impacts how people feel about privacy and their rights to do what they want on their property. -- "The American press called such atrocities acts of "frightfulness," the word then used to describe what later generations would call terrorism." Unfortunate how the latter word has been ascribed as a trait to a certain religion as well when any act of such violence would be deserving of the word. Also, euphemisms to avoid saying something shocking, what a fascinating habit of language. -- "...the Bealgian city of Louvain, the "Oxford of Belgium," a university town that was home to an important library. Three days of shelling and murder left 209 civilians dead, 1,100 buildings incinerated, and the library destroyed, along with its 230,000 books, priceless manuscripts, and artifacts." Ouch. OUCH. That hurts my soul to read. -- "Hook - who in later life would indeed be promoted to Captain Hook..." That is fantastic, truly. -- "Christ traveled among them as well: Christ Garry, of Cleveland, Ohio, in second class." What an interesting name for a person! -- ""You don't pay much attention to the construction of ships?" "No, as long as they float; if they sink, I get out."" Hah! -- "So every night," he said, "I slept with a torpedo and a puppy." -- "Then came the fragrances that emanated from the kitchen long after meals were cooked, most notably that close cousin to male body odor, day-old friend onions." LOL because this is so true. -- "Wilson ordered her a copy from a bookseller, but in the meantime he sent over a copy from the Library of Congress." Is the Library of Congress like the president's lending library or something? Can he do that?! This could possibly be the only reason I would ever wish to be a US president. -- "Finding these things was half the fun. Every book is an expedition into unfamiliar realms, with both an intellectual and a physical component. The intellectual journey takes you deep into a level of expertise. A focused expertise, however. Am I an expert on World War I? No. Do I know a lot now about the Lusitania and World War I-era U-boats? Yes. Will I ever write another book about a sinking ship or submarine warfare? Most likely not." Maybe there is hope yet that my myriad obsessions will result in something worthy of publication, on paper or online, someday. 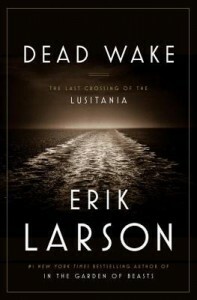 "When writing about the Lusitania, one has to be very careful to sift and weigh the things that appear in books already published on the subject. There are falsehoods and false facts, and these, once dropped into the scholarly stream, appear over and over again, with footnotes always leading back to the same culprits." Probably the most accurate author's note I have ever read, and a truth that most authors ignore to support their own hypotheses.